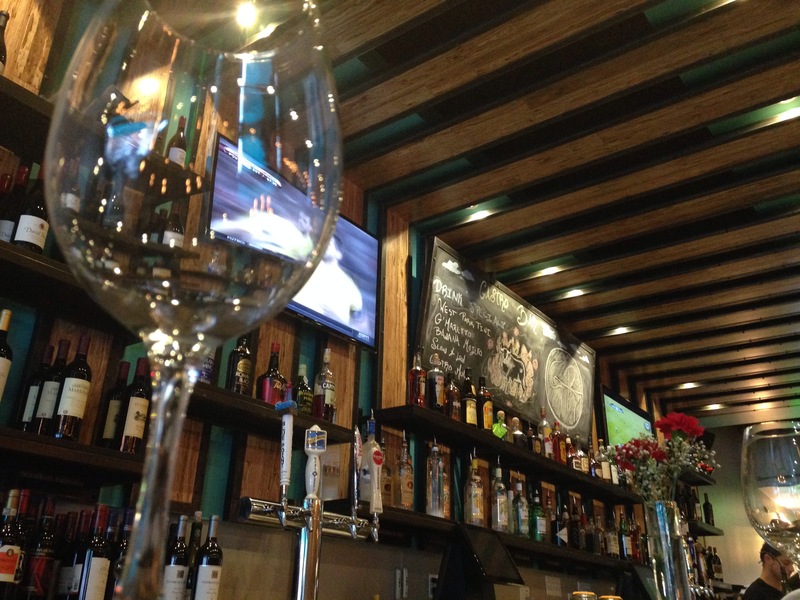 A new restaurant has opened in Stamford with food and decor that is as vibrant as the downtown scene it now calls home – Gastro Bar! 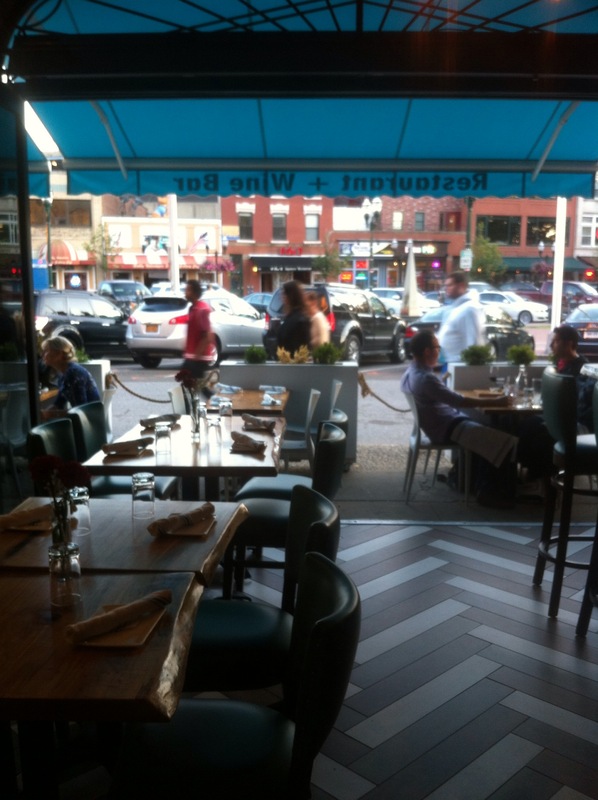 Overlooking Columbus Park Circle from its location at 78 West Park Place, Gastro Bar’s large glass doors open onto their outdoor patio area allowing diners to experience the energy of both the restaurant and downtown Stamford no matter if they prefer eating inside or out. A pop of bright teal blue begins with the awning and sign and carries throughout the restaurant itself with beautiful blue leather upholstered chairs. Exposed brick, the dark wood of the long bar, and hand painted murals help to create an atmosphere that is comfortable yet full of energy in a space which seats about 80 people. 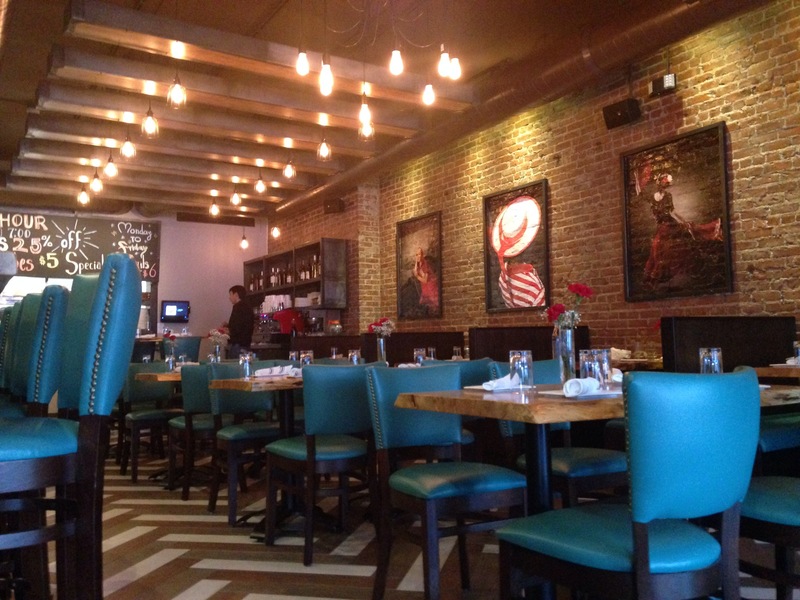 Mediterranean flavors and tapas are the foundation of Gastro Bar’s menu and you can see the influence of Italian, French, and Spanish cuisine along with the Ecuadorian background of owners, and brothers, Mario and Alejandro Lopez, and Excecutive Chef Fernando Gomez. With the word “bar” as part of its name, we had to try several cocktails off of Gastro Bar’s specialty drinks menu. 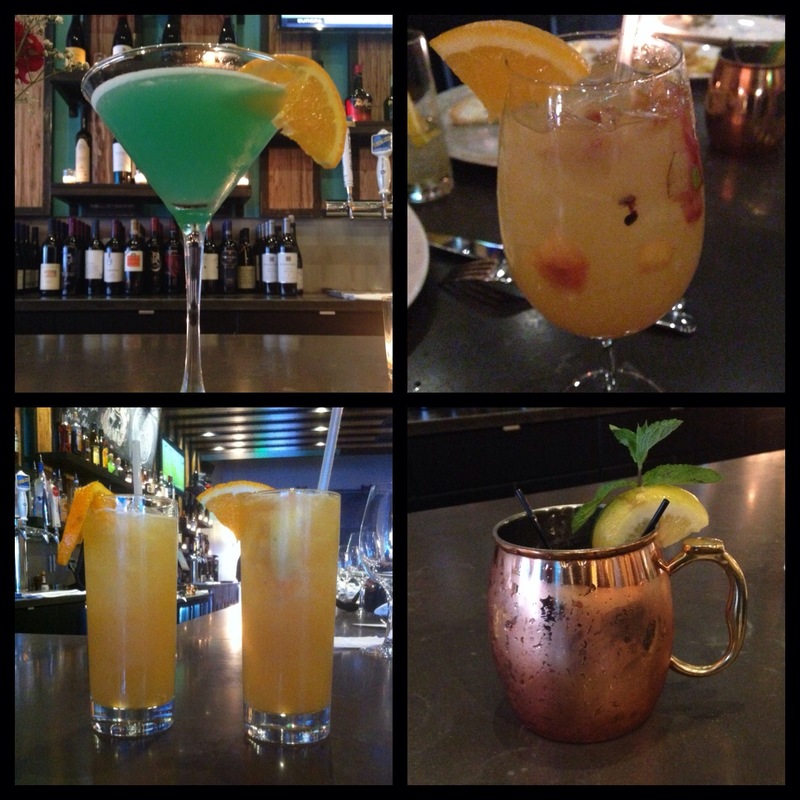 Above is pictured the West Park Tini (top left), White Sangria, which is made in house and sold by the glass or the pitcher (top right), the G’Maretto and the Slow & Low (bottom left), and the Gastro Mule (bottom right). 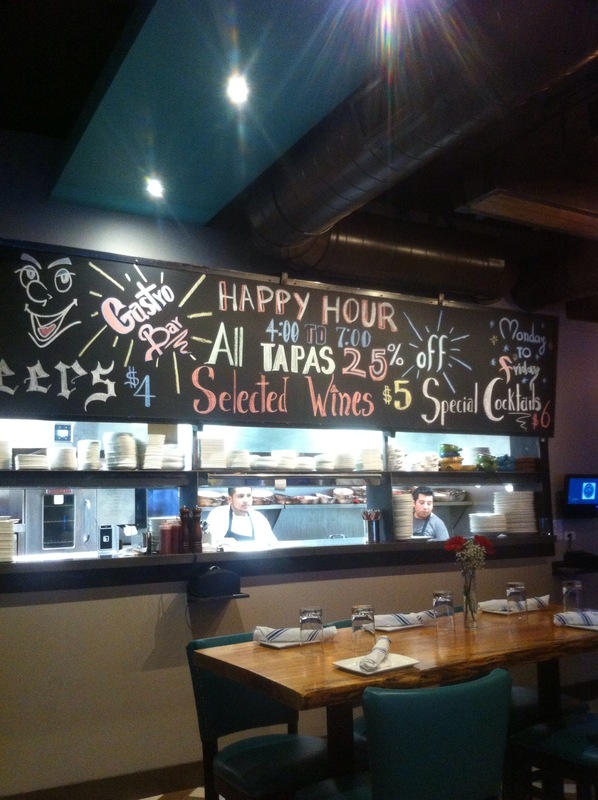 One of my favorite parts of dining at Gastro Bar is the array of appetizer and tapas to choose from! From pizza to fried calamari to oysters, Gastro Bar has a large selection of appetizers perfect to start off your meal, or if you prefer to have some tapas or small plates and a cocktail. 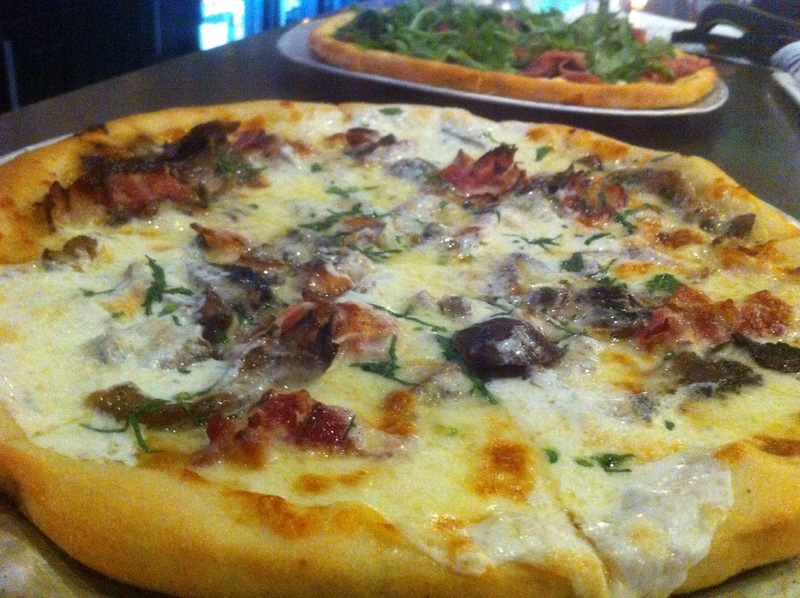 The Mushroom pizza (above) made with mushrooms, bacon, and fontina cheese was very popular with our entire group . 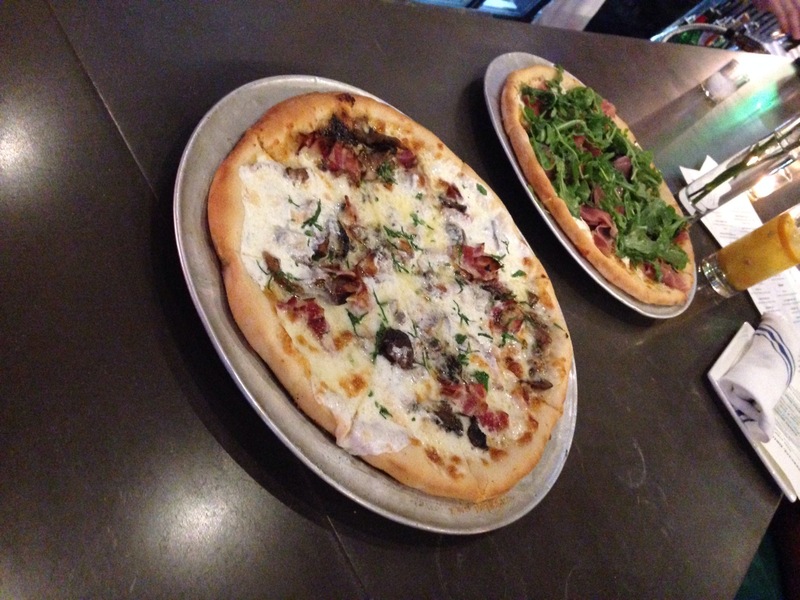 The Fig and Goat Cheese pizza was my favorite and I cannot wait to order it again next time I visit Gastro Bar. 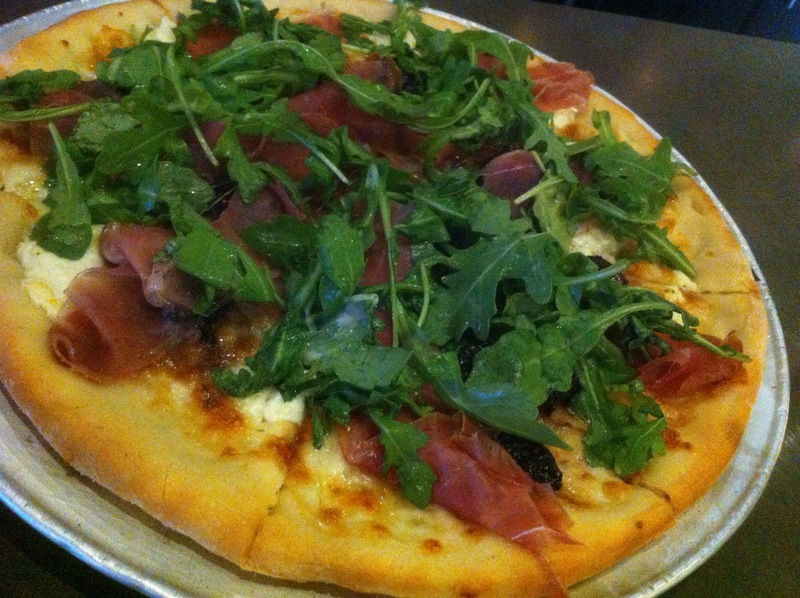 Made with figs, goat cheese, a 10 year balsamic, proscuitto, and arugula, this pizza is light and packed with flavors from all the ingredients which compliment each other very well. 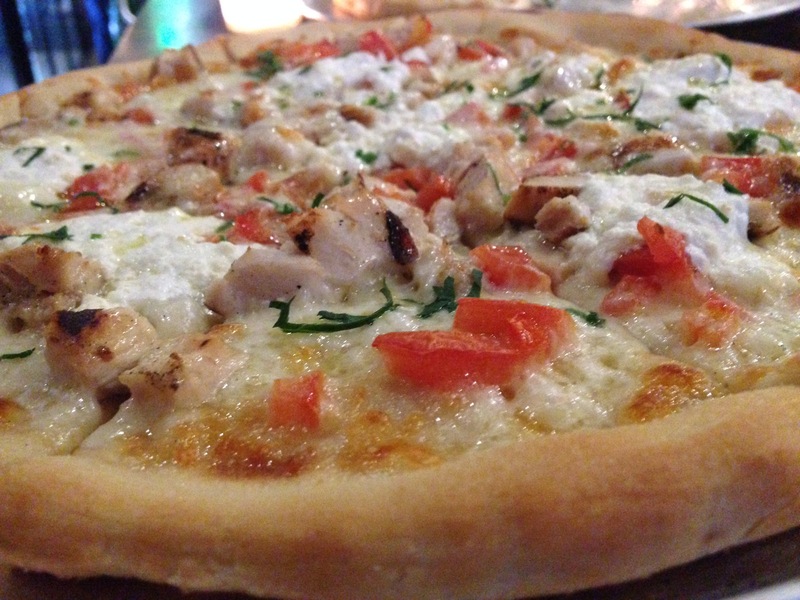 Grilled chicken, tomato, ricotta, and truffle oil comprise this simple, yet tasty, pizza that our group really enjoyed. 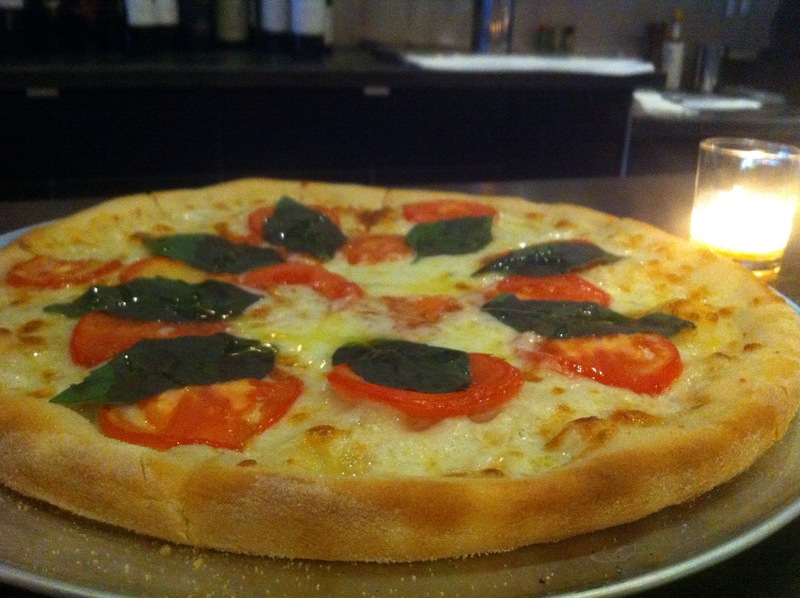 Hierloom tomato, buffalo mozzarela cheese, and basil are what makes this classic Margherita pizza. 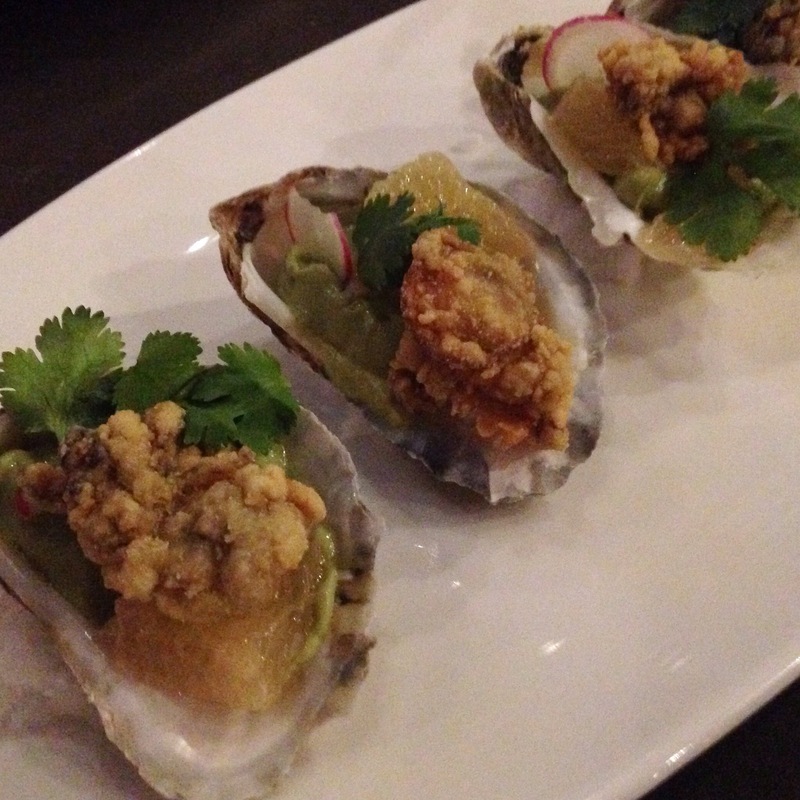 Gastro Bar’s crispy oysters are uniquely served over an avocado puree topped with grapefruit and radish. 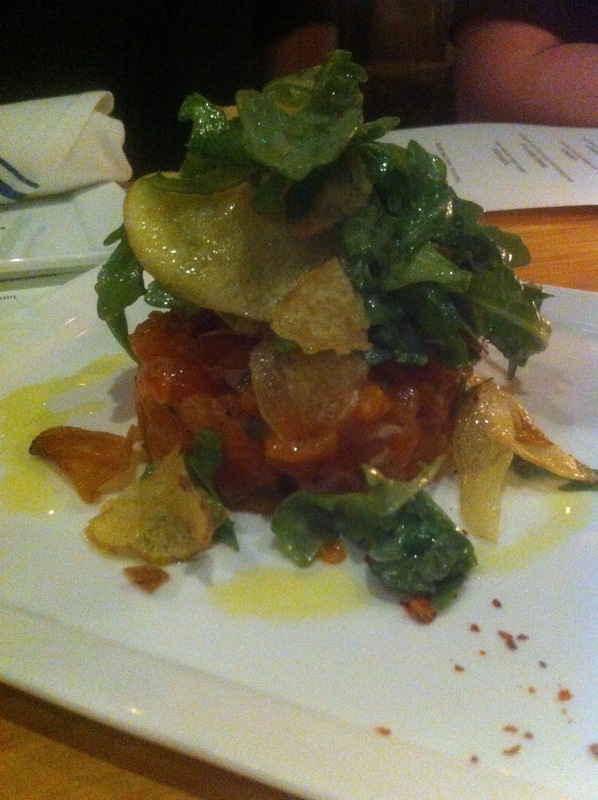 The Salmon Tartar is excellent and something I would highly recommend you order and try at Gastro Bar. Made with jalapenos, shallots, crispy potatoes, and cilantro, this Salmon Tartar is very fresh and gives you a small kick from the jalapenos. 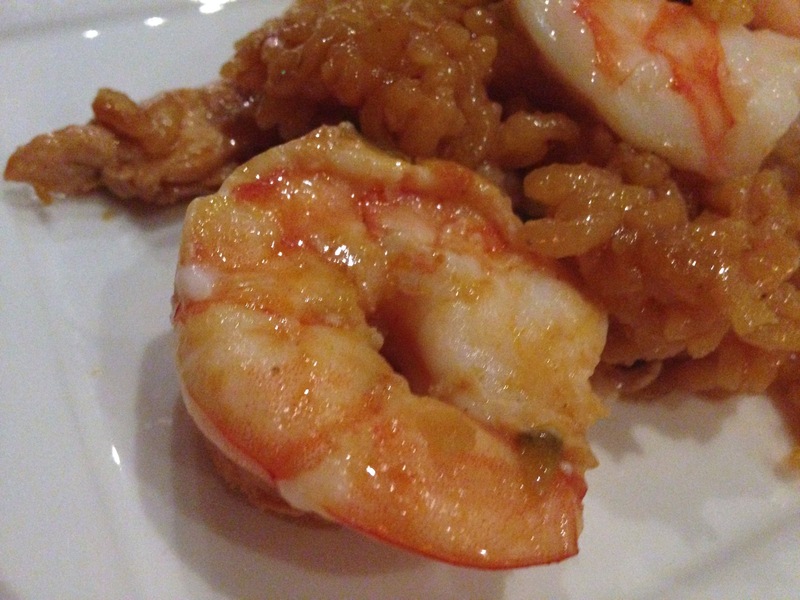 The crispy potatoes, which are somewhat like potato chips, add a light saltiness to the dish. 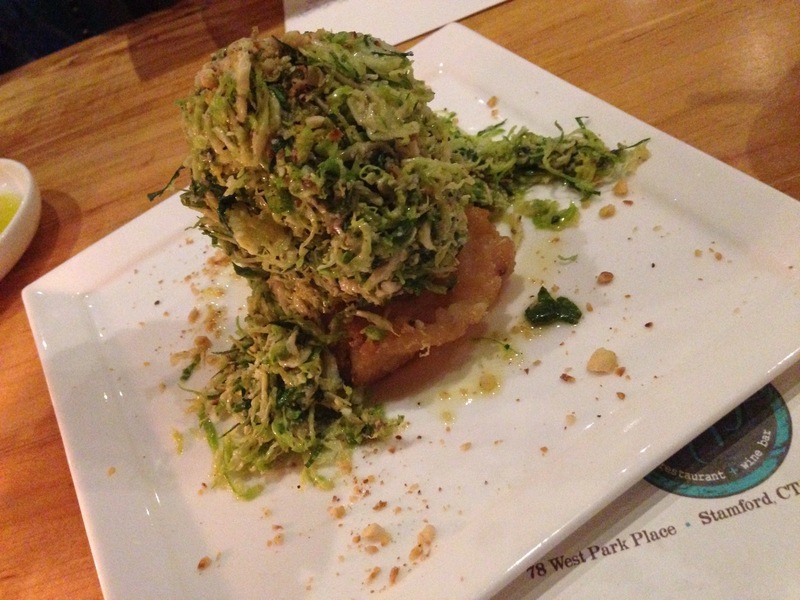 Shaved brussels sprouts, truffle oil, and lemon juice presented on top of a crispy and delicious risotto cake make for a very different kind of salad. The shaved brussels sprouts are very light and somewhat crunchy, as you would expect with a salad, and the truffle oil creates a slight nutty flavor. You could think of this salad as brussels sprouts deconstructed essentially, and if you like brussels sprouts and are looking for a unique way to eat them then this dish is for you. 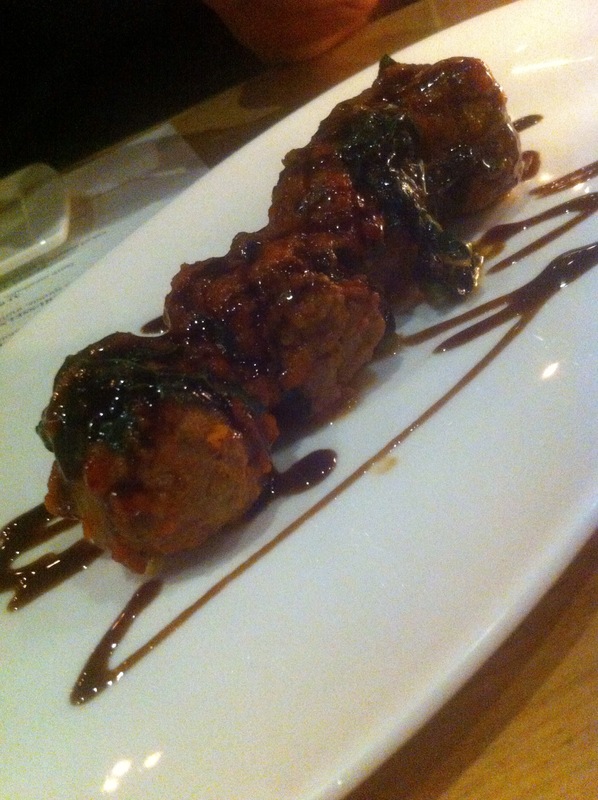 The albondigas are essentially lamb meatballs made with baby kale and tomato sauce with a 10 year balsamic reduction drizzled over the top and they taste as good as they sound! When I tried a bite all I could think was – WOW, WOW, WOW! Eggplant Parmesean is one of my favorite dishes. I order it often and occasionally use it to help me decide how I feel about a restaurant. 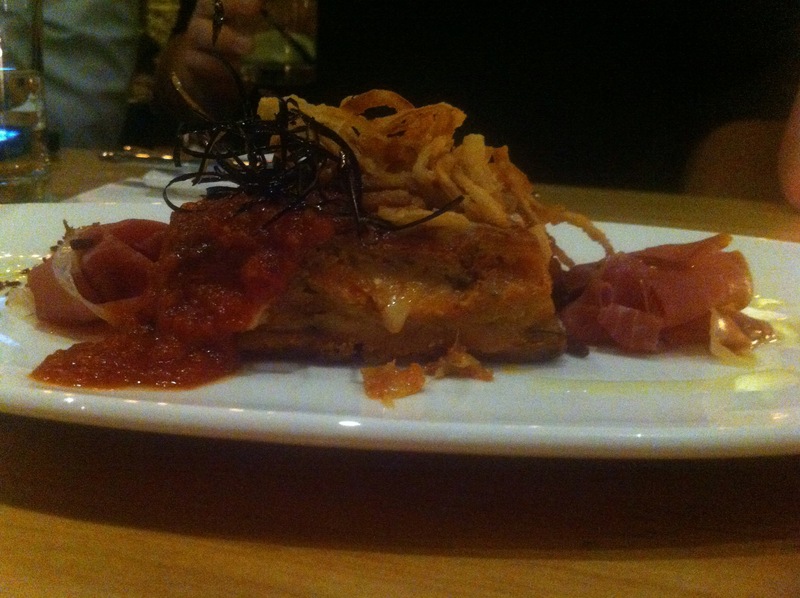 The Eggplant Parmesean at Gastro Bar made my list of favorites and I would make the drive here just for this dish. 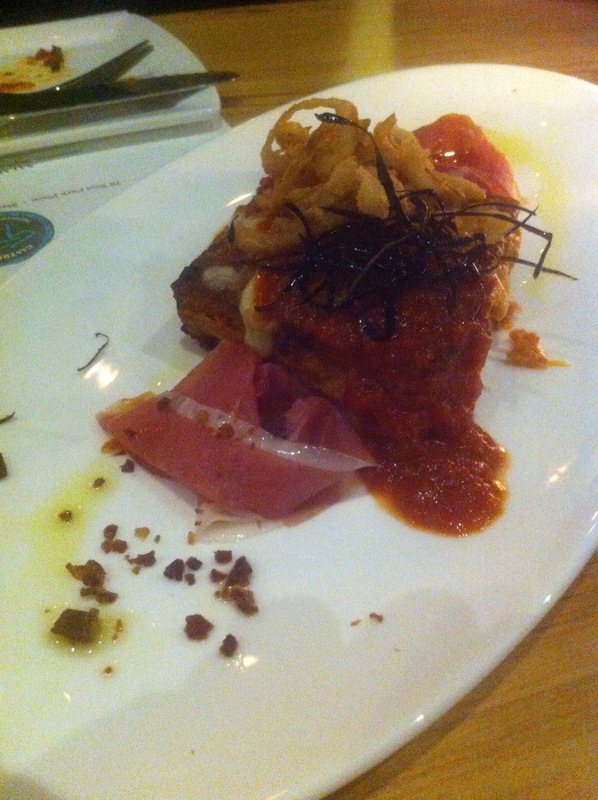 Baked eggplant, prosciutto, marscarpone and ricotta cheese. If you’re looking for a hearty pasta dish, especially since our New England Autumn will soon turn to Winter, then I would suggest the Cavatelli at Gastro Bar. 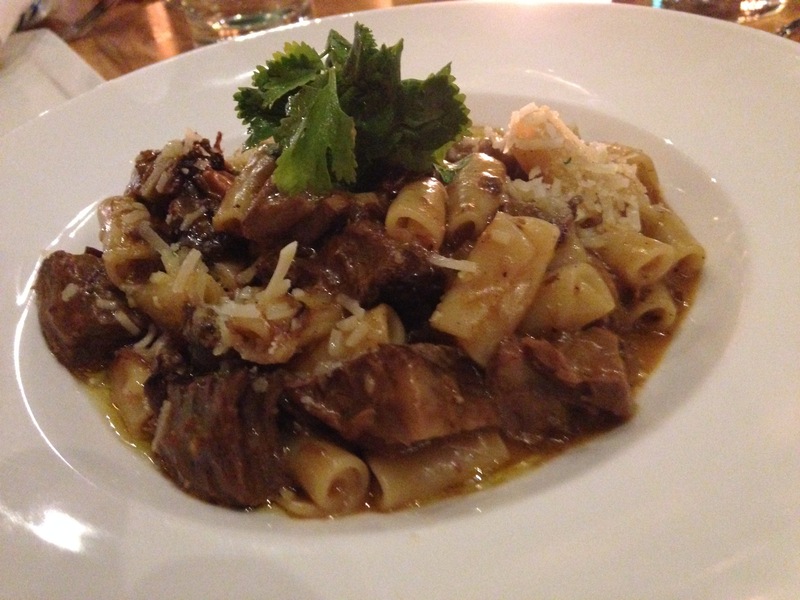 The short rib ragu is cooked with red wine vegetable stock and combined with black truffle and cream and if you’re wondering if you should order it, my answer is a resounding YES. I went into my first bite slightly biased since I don’t really like horseradish, however I have to say that I was pleasantly surprised and the dish was popular with our group. 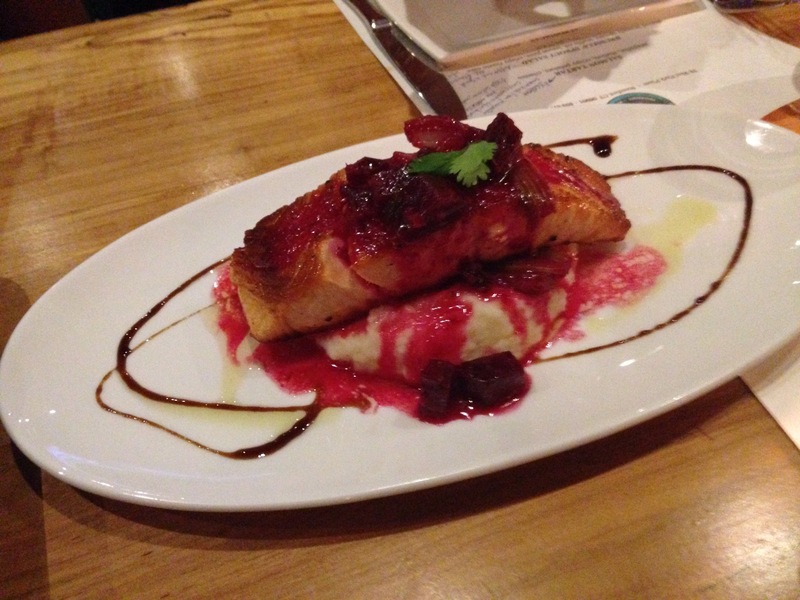 The salmon is cooked perfectly and the flavors of the horseradish, beets, and celery pair nicely with the salmon and the potatoes. 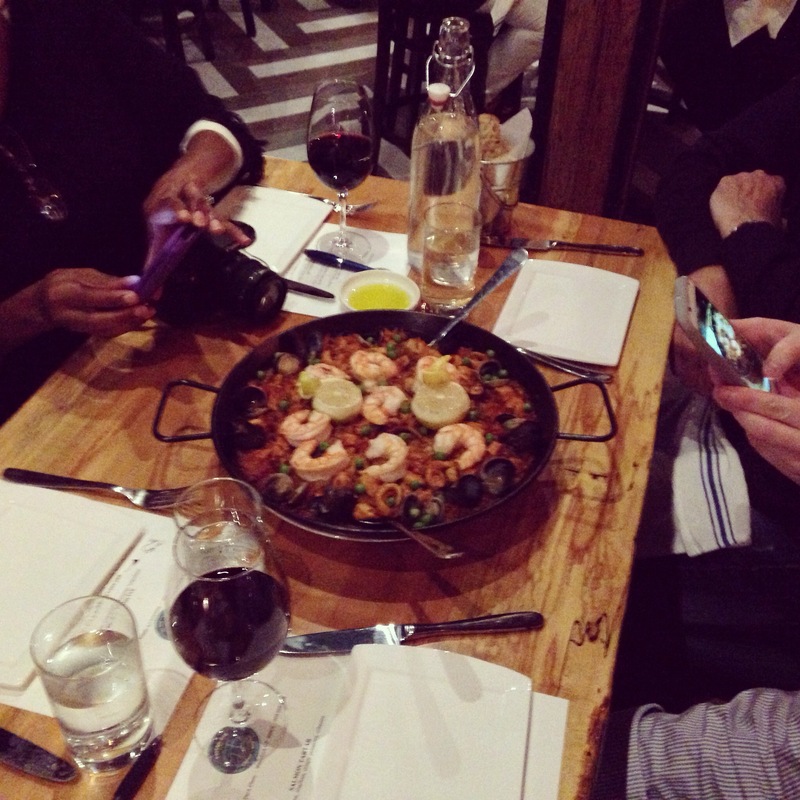 Our final dish was the Paella. Clams, shrimp, chicken, mussels, calamari, sweet peas, chorizo, and saffron rice are all cooked together to create this truly impressive dish. 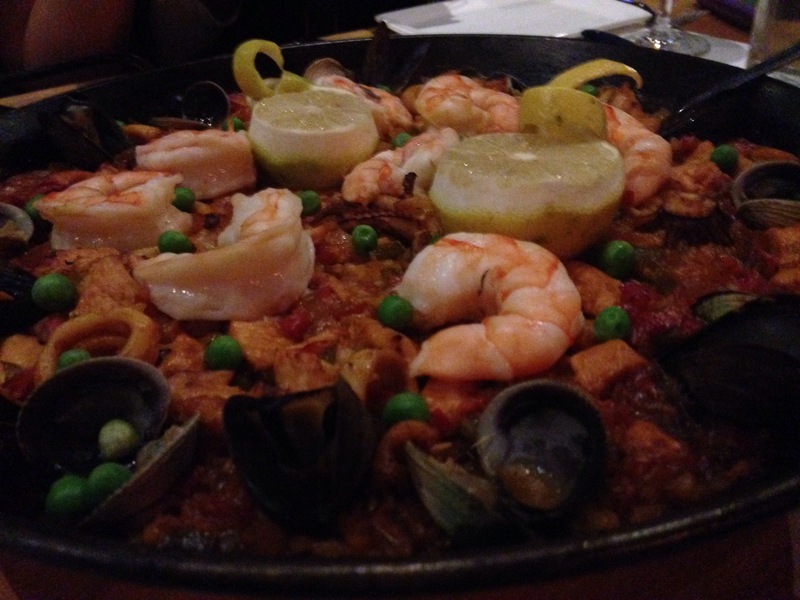 Quite possibly the best paella I have had to date, the paella is something you must try at Gastro Bar. 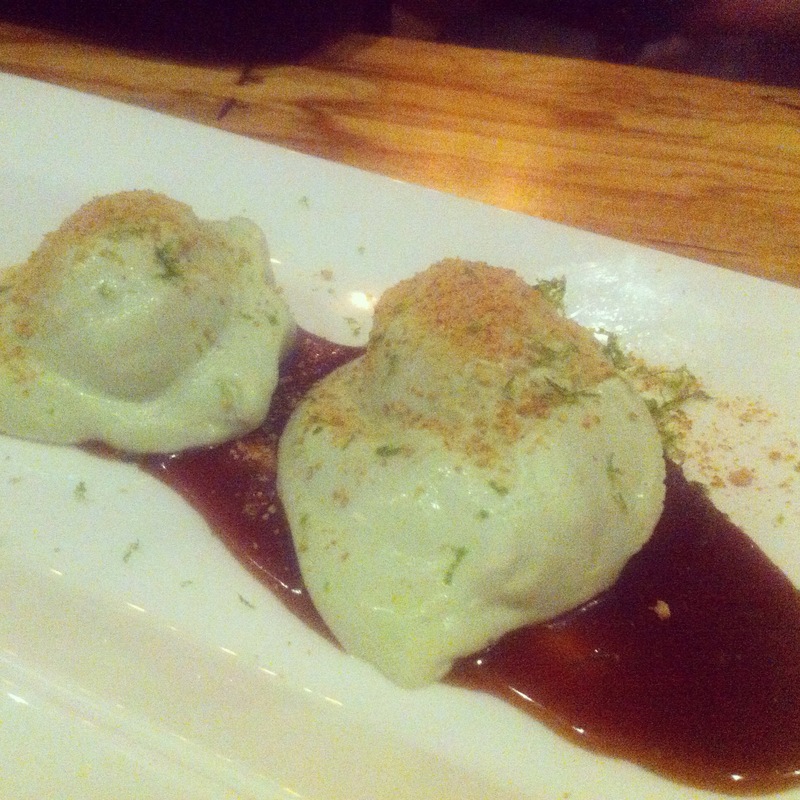 If you’re looking for something that’s a little different for dessert I would suggest you try the key lime mousse; it has all the flavors of key lime pie but in the form of a mousse and it is delicious. Isn’t it beautiful? 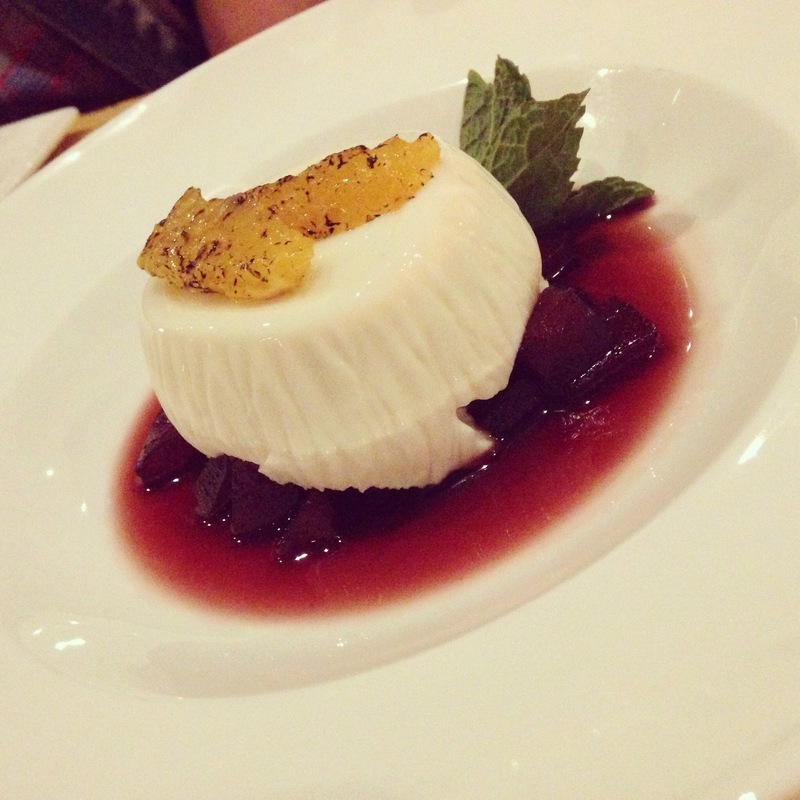 The Panna cotta is a creamy and somewhat gelatin Italian dessert that is usually served with fruit or something similar. The panna cotta at Gastro Bar is served over a red wine sauce from which is takes a little flavor while remaining light.